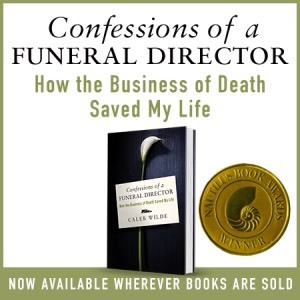 CONFESSIONS OF A FUNERAL DIRECTOR » Is God Your Crutch? « Would You Consider a Green Burial? Death brings out the religiosity in all of us. If you’re a reader of my blog, you may realize that I’m rather critical of the whole God as Cosmic Santa Claus motif. AND, I’m rather critical of using God as the Grand Band Aid who fixes everything, including death. Somethings have no answer. Some valleys are dark. I’m not the only one who is critical of the “God as crutch”. Freud, Marx et al; as well as a few Christians like Pete Rollins and, one of my favorite authors, Richard Beck are also critical of using God as a means to assuage our existential turmoil. In The Authenticity of Faith, Beck suggest five strong beliefs for the believer who uses God as a defense mechanism / crutch / Grand Band Aid. 1. Special Protection: In the face of a hostile universe, the belief that God will especially protect the believer (and loved ones) from misfortune, illness, or death. The universe is existentially tamed. 2. Special Insight: In the face of difficult life decisions, the belief that God will provide clear guidance and direction. God’s guidance reduces the existential burden of choice. 3. Special Destiny: In the face of a life where meaning is fragile, the belief that God has created a special purpose for one’s life, a destiny that makes life intrinsically meaningful. 4. Divine Solicitousness: The belief that the omnipotent God is constantly available and interested in aiding the believer, even with the mundane and trivial. God is an eternal servant, our cosmic butler. 5. Denial of Randomness: In a life full of random, tragic, and seemingly meaningless events, the belief that God’s purpose and plan is at work. No event, however horrific or tragic, is existentially confusing or disconcerting. All is going according to plan. These beliefs are meant to step in and remove or reduce the anxiety of the loss of our assumptive world. Together, they can form our crutch. Do you use ALL of the above beliefs? Do you use SOME of the above beliefs? This entry was posted by Caleb Wilde on November 15, 2012 at 3:51 pm, and is filed under Denial. Follow any responses to this post through RSS 2.0.You can leave a response or trackback from your own site.